The scatterplot shows the relationship between the number of wins in 2014 and the improvement of wins in 2015 for 15 Major League Baseball teams. The data are from https://www.teamrankings.com/mlb/trends/win_trends/.
. [7.] 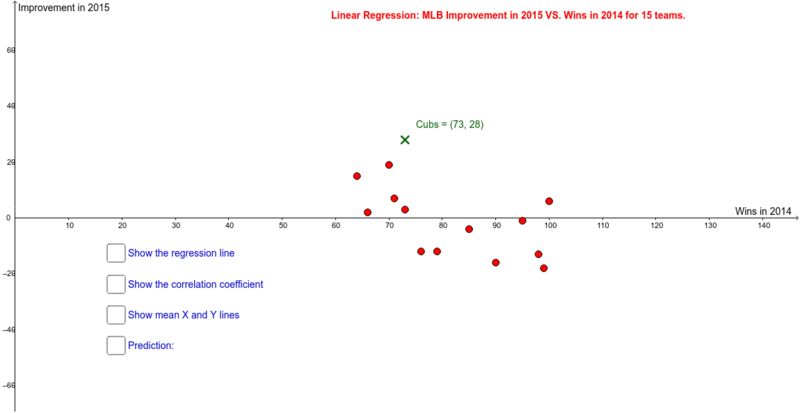 Use the line to predict the number of Improvement in 2015 for the Chicago Cubs. Find the residual for this team. [8.] You should find that the Chicago Cubs won 28 games in this season. Predict the team's improvement in the following season. Does it make sense to use this linear model to predict the Chicago Cubs' performance in the following season? Why?